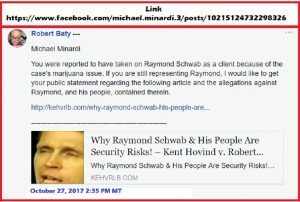 Why Raymond Schwab & His People Are Security Risks! – Kent Hovind v. Robert Baty – The Great Debates! Home→Why Raymond Schwab & His People Are Security Risks! 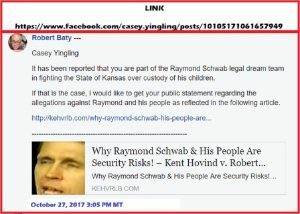 Raymond Schwab (aka Seraphim) appears to fancy himself a leader in the anti-government, anti-child welfare movement and has historically and publicly threatened those involved in his child custody case and others who did not agree with him and followed him into the public square to address the important public issues raised for consideration. That he and his people have, because of their antics, created a real and present risk to those they interact with is evidenced by the increased security that has, reportedly, surrounded Raymond’s appearances at veterans facilities and court proceedings involving his child custody issues. Raymond and his promoters (i.e., Meko Haze, Jennifer Winn, Terri LaPoint, AlmaAnn Klassen-Jones, Medical Kidnap, et al) have sought to control what some consider their false narrative regarding the child custody case and, in particular, the alleged circumstances under which the children were originally taken in to State custody more than 2 years ago. In recent days, information has been submitted to me, Robert Baty, which raises serious questions regarding Raymond’s narrative regarding the circumstances at the time the children were taken, and he and his wife, Amelia, have been asked to respond to the allegations. 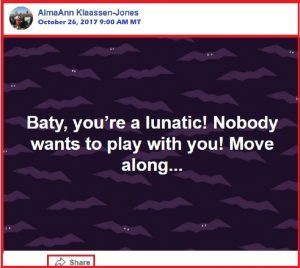 Instead of openly and honestly engaging in a discussion of the allegations, Raymond and his people have again resorted to attacking the messenger, Robert Baty, including veiled threats. Following are the link to a FaceBook thread and what has been posted there in the last day or so in order to document the course chosen by Raymond and his people in lieu of openly and honestly engaging in the discussion of the very public issues he has presented for our consideration. A couple of posts from the page of one of Raymond Schwab’s supporters; showing their preference for violent rhetoric which could indicate a tendency toward violent action which Raymond Schwab is known to have exhibited at times. Perhaps as a result of a “consciousness of guilt”, the following posts were removed from Jamie Petitt’s FaceBook page. 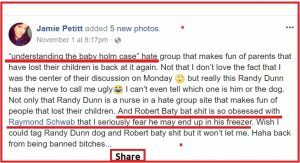 Meko Haze v. Robert Baty – The Taking of the Scwhab Children!